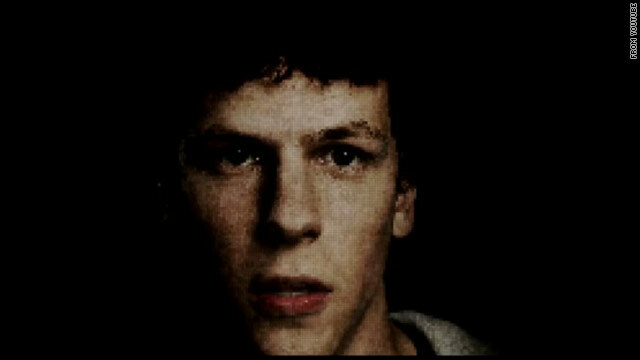 Jesse Eisenberg is the face of Facebook creator Mark Zuckerberg in "The Social Network." Facebook movie based on Ben Mezrich's novel "The Accidental Billionaires"
(CNN) -- A teaser trailer recently released by Columbia Pictures provides a brief glimpse at "The Social Network," Hollywood's take on Facebook that's scheduled for release in October. The film, possibly better known as "The Facebook Movie," tracks the early days of the site that would grow to become, hands down, the biggest name in online social media. It follows the apparently huge drama surrounding creator Mark Zuckerberg's online success and fallout with friend Eduardo Saverin. Written by Aaron Sorkin, directed by David Fincher and starring Jesse Eisenberg as Zuckerberg, the movie is loosely based on Ben Mezrich's novel "The Accidental Billionaires," (which is, in turn, loosely based on reality). "Some have questioned why Facebook and its story was worthy of a film, let alone a film from A-level writers and directors," Mashable's Christina Warren wrote. "Well, think about just how much Facebook dominates the online communication space today. Now consider that it was started only six years ago. "Its overwhelming success and the fact that it has become important enough to drive ongoing discussions regarding privacy and data ownership is indicative that it is a force." The short and simple teaser promises a juicy and riveting film. With bold, large text, Zuckerberg is heralded as a "punk," "genius," "prophet" and "billionaire," each statement emphasized by an ominous punctuation of sound and an appropriate voice-over. "You don't get to 500 million friends without making a few enemies," the trailer reads, promising a film that'll have some Facebook users wondering why they never knew anything about its history before. "The film is as much an exploration of young people coming to terms with creating something bigger than themselves as much as it is about loyalty, jealousy and money," Warren wrote. Now, the only question is, will it be more entertaining than this Facebook video?